The Ejector Venturi Chlorine Scrubber has gained wide acceptance commercially and industrially as an efficient and low cost means of air pollution control. 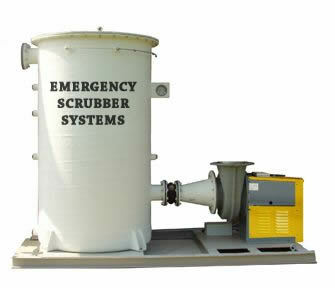 Scrubbing liquid is supplied to the motive inlet under pressure. As a result of the large drop in liquid pressure across the nozzle, a high velocity liquid spray exits the nozzle. This atomized liquid provides surface area for transfer of mass from the gas to the liquid phase and allows for capture of particulates from the gas phase due to impaction. In addition, the velocity of the liquid spray creates a negative pressure which pulls gas into the Chlorine Scrubbers. Get an Idea of Particle Sizes !